Cornbread is a necessary staple during the cooler winter months, as it is the perfect side for soup, stew or chili! 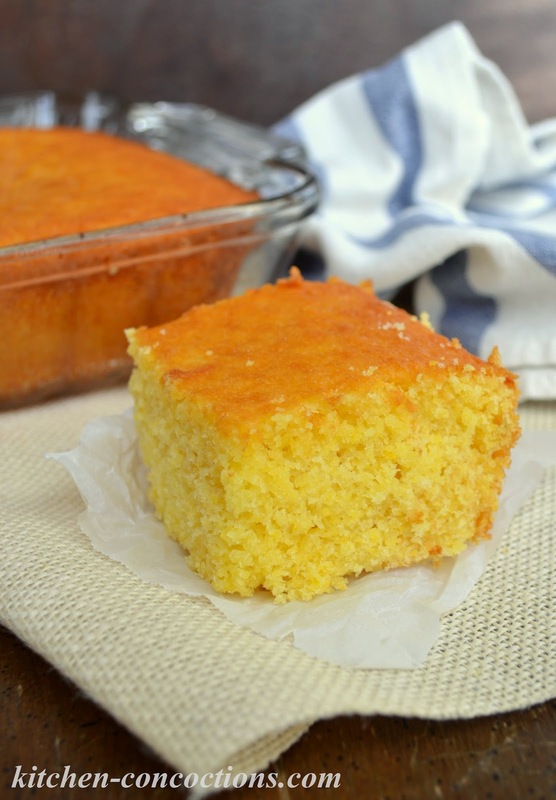 This version, inspired by a popular restaurant chain, is a quick and easy sweet cornbread that will feed a crowd! I have another confession (seems like I a full of them as of late!). I only started making homemade, as in 100% made from scratch, cornbread right before I started blogging, about 6 years ago (side note: now I have a whole collection of cornbread recipes published here). Not that homemade cornbread is difficult. I mean every bag of cornmeal has a basic cornbread recipe on it and our trusty family cookbook has a fantastic, yet simple recipe, from my great aunt, as well. It’s just that for most of my life, my Mom (as well as my Grandmother) always made cornbread… wait for it… from a box. A box of Jiffy cornbread mix, to be exact. So naturally, after I moved away from home, that little blue box followed me and that’s what I always used. But then I started to really cook and bake (and blog) and usually making scratch cornbread was easier… because I always had the ingredients on hand. 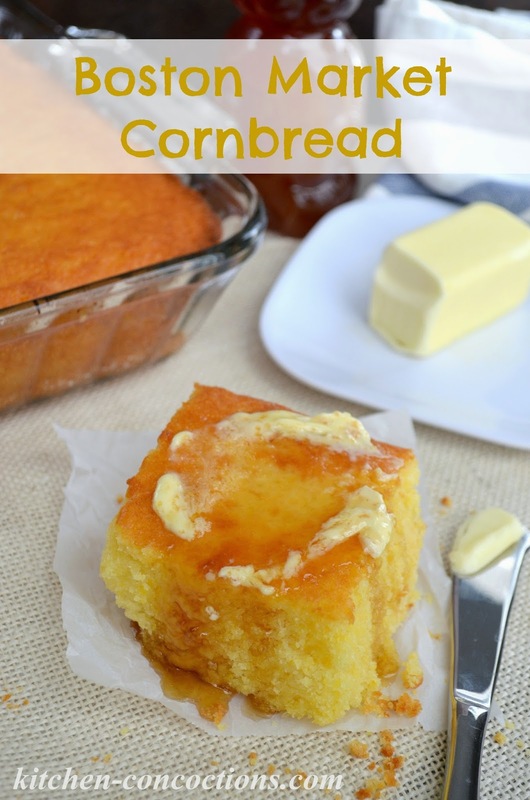 But every once in awhile, when I am feeling lazy or I just get a craving for cornbread “just like Mom use to make” (LOL! ), I grab a box of Jiffy and whip some up! That’s why when I saw this recipe for Copy Cat Boston Market Cornbread, which calls for “doctoring” two boxes of Jiffy Cornbread Mix I had to try it. This recipe is extremely easy and is a great way to dress up a few box mixes. This good ole’ buttery, sweet style cornbread will feed a crowd… perfect for a chili dinner with friends on a cold winter night! 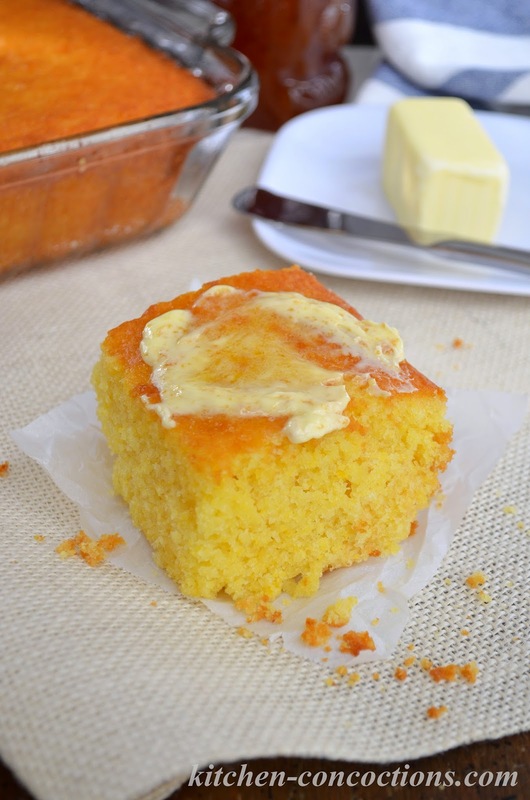 A quick and easy sweet cornbread recipe inspired by a popular restaurant. Preheat the oven to 350 degrees F. Spray a 9×13-inch baking dish with cooking spray. Set aside. In a large bowl, stir together both boxes of cornbread mix and butter cake mix. In a separate large bowl, whisk the eggs until combined. Whisk the buttermilk and canola oil into the eggs. Add the egg mixture to the bowl with the cake mix and stir until well combined. Pour the batter into the prepared baking dish. Bake in the preheated 350 degree F oven for 30 minutes, or until a tester inserted in the center comes out clean. Serving suggestion: This cornbread would be perfect with a big bowl of chili, like this Slow Cooker Bourbon Beef and Bean Chili, or serve it along side some Crock-Pot Baked Beans and Honey Mustard Grilled Chicken at your next barbecue!